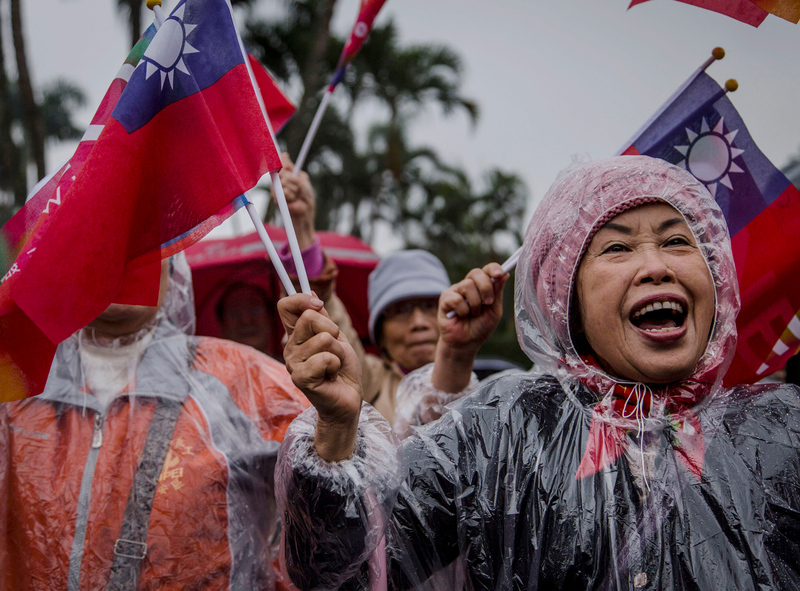 Supporters of the Guomindang (KMT) party cheer during a rally campaign ahead of the Taiwanese presidential election, in Taipei, Taiwan, January 15, 2016. In a major speech in early January, China’s leader Xi Jinping called unification across the Taiwan Strait “the great trend of history,” and warned that attempts to facilitate Taiwan’s independence would be met by force. Taiwanese President Tsai Ing-wen immediately condemned Xi’s speech and countered that “Taiwan absolutely will not accept ‘one country, two systems,’” Beijing’s formula for governing Taiwan after a putative unification with the mainland. The wave of popular support received by Taiwanese president Tsai Ing-wen after Xi Jinping’s January 2 speech proves a strong counterpoint to reports in international media suggesting that the resurgence of the Guomindang (KMT) in November elections means that the Taiwanese have warmed to China in the three years that Tsai has been in office. Indeed, despite growing domestic dissatisfaction against Tsai and the DPP, Xi’s speech led the Taiwanese to rally behind Tsai—suggesting that Xi’s speech achieved the opposite of what it was meant to do. Although Xi called on Taiwan to accept the framework of “one country, two systems,” his speech actually pushed Tsai towards rejecting the 1992 Consensus, which Tsai had sought to be deliberately ambiguous about. When she took office in 2016, Tsai referred to the “historical fact” of the 1992 talks, yet sought to avoid the perception that this was outright rejecting the 1992 Consensus. Xi also seems to have inadvertently sparked blowback against the KMT, which was forced to retreat on attempts to push for closer cross-Strait relations, and demonstrated some internal splits afterward. This strongly casts doubt on the readings of the November 2018 elections which suggest that Taiwanese voters have swung towards support of closer relations with China. Xi’s speech should lead to questions about how accurate China’s perceptions of Taiwan are. Xi continued to offer the framework of “one country, two systems” to lure Taiwan. But residents of Taiwan know that this has not worked out for Hong Kong, with the sharp deterioration of democratic freedoms there after the 1997 handover, as observed in the banning of candidates critical of Beijing from running for office, or their disqualification after election victories, despite legal promises that Hong Kong’s political sphere would remain unchanged until 2047. It is possible that Xi was himself guided by an overly optimistic assessment of what the November 2018 elections indicated for cross-Strait relations. At the same time, this does not necessarily mean Taiwanese will not vote for the KMT or other pro-unification political forces in 2020 elections. Despite Tsai’s current wave of popular support, cross-Strait concerns could drop out of Taiwanese voters’ considerations once again in 2020, with domestic issues or a desire to punish the DPP taking precedence. Cross-Strait concerns have long since ceased to be the only concern guiding the political decisions of Taiwanese voters, and Taiwanese could vote KMT again. Yet, we must examine the geopolitical background to understand what motivated Xi to give this speech. Namely, the fundamental crisis facing China is that if Western countries are constructing a policy of containment towards China in the form of the U.S.-China trade war, how should China try to break out of this containment? Moreover, what role does Taiwan play in this? With the gradual shaping of American Indo-Pacific strategy, the U.S. and some of its allies, such as Japan and the E.U., have increased the number of exchanges they conduct with Taiwan. To counter this, Xi wants to cut Taiwan off from any moves towards independence, or force the international community to take the view that China has suzerainty over Taiwan. As such, with his speech, Xi is attempting to remind the world to “mutually respect territorial integrity and sovereignty.” This is a call on the world to respect Chinese sovereignty over Taiwan, and why he cites the “Five Principles of Peaceful Coexistence.” Xi also attempted to remind the world that China reserves the threat of force against Taiwan. This threat of forcible unification was not only directed against Taiwan, but also at American actions in support of Taiwan. Given that the U.S. and its allies are lending more military and diplomatic resources to Taiwan, Xi appears more worried that Taiwan will be pulled toward independence, and he may try to stop the trend by waving the red flag of forcible unification. However, why is Xi still attempting to push for “one country, two systems”? On the surface, this seems illogical, since Beijing likely realizes that Taiwan would not be so easily convinced by the notion. Yet, asserting this notion creates space for coordination with local collaborators—in other words, to win over those who might seek to represent Beijing in Taiwan. It aims to create divisions within Taiwan’s democracy by cultivating proxies representing Chinese interests in Taiwan. As such, Xi’s speech is fundamentally a divide-and-conquer strategy. Widening domestic social divisions make it harder for Taiwan to defend against China or to consolidate its democracy in the face of Chinese threats. Although the pro-Western Democratic Progressive Party is currently in power, pro-China forces continue to exist in Taiwan, and these pro-China forces have consolidated a good deal of socially conservative forces behind them as allies. As such, if the KMT retakes power in 2020, and if the new government begins to enact pro-China policies, the situation will change, and American strategic trust in Taiwan will be broken. The claim that China’s economic lull is compelling Xi to use nationalistic “rally round the flag” and anti-independence rhetoric is a difficult causal relationship to establish. First and most obviously, nothing Xi said in his recent speech is new: Everything from “unification is inevitable” to “we will not rule out the use of force” has been heard countless times, every year, from Mao to now. If we compare this year’s speech to his previous speeches, Xi actually comes across as less aggressive—his tone was significantly sharper after Tsai’s 2016 victory. Moreover, Xi’s actions were harsher two years ago. Following Tsai’s victory, the Party was completely unwilling to have any open dialogue with Taiwan, yet after the November 2018 Taiwanese midterms, the Chinese Communist Party expressed willingness to talk to certain Taiwanese leaders. Although the hypothesis that as China’s economic stability goes down, Xi’s likelihood to evoke nationalistic rhetoric goes up is likely true, I do not think Xi’s recent speech is proof of such a relationship. Rather, it is business as usual. During the most recent midterm election, cross-Strait relations were not an issue. Instead, people focused on the Democratic Progressive Party’s (DPP’s) poor performance with pension and labor reform, or the controversial LGBTQ referendums. China was absent from most political discussions. However, in reaction to Xi’s recent speech, Tsai has doubled down on defending Taiwanese autonomy. Her statement rejecting Xi, the ’92 Consensus, and proposal of One Country, Two Systems was translated into dozens of languages and circulated around the Internet. Tsai’s sudden focus on Taiwanese identity has been met with praise and support, and she may be regaining some much-needed popularity. Several deep-green pro-independence elders recently came out against Tsai, saying someone ought to run in her place in the 2020 election. Although Tsai may be in trouble, her recent invocation of Taiwaneseness and resistance to Xi has caused people who a month ago were highly critical of her to suddenly vocally endorse her. We saw this from members of the New Power Party, Social Democratic Party, who endorsed her response to Xi, as well as from the famous independence activist Su Beng and from Lao Dan, a well-known organizer from Taichung who expressed support in her as a presidential candidate. As Xi’s anti-Taiwan rhetoric rises, it gives Tsai opportunity to present herself and the DPP as defenders of Taiwan’s autonomy, increasing her popularity. Although the DPP seemed to be in dire trouble for the 2020 election, Xi could very well have sparked the support the DPP desperately needs. On January 2, 2019, Xi Jinping unveiled his updated definition of the 1992 Consensus in a highly ceremonious event to honor the 40th anniversary of an official document that formally ended the Maoist policy to take Taiwan with force. On the surface, there was not much new in Xi’s remarks. China will resort to military force if Taiwan moves toward independence. Xi’s speech was intended to craft a coherent narrative from Deng Xiaoping’s rudimentary one country, two systems proposal to Beijing’s current policy toward Taiwan. In China’s political context, such lexical construction was necessary to cement Xi’s ascendancy to most powerful leader since Mao Zedong. Since the speech was primarily geared toward a domestic audience, it paid little regard to the Taiwanese. Tsai quickly responded to Xi’s remark with a defiant speech, which flatly rejected the one country, two systems application to Taiwan. She also deftly equated the 1992 Consensus with the one country, two systems proposal, which was hinted but not clearly enunciated in Xi’s talk—so that her KMT opponents had to respond. KMT heavyweights, including Ma Ying-jeou, Wu Den-yih, and Eric Chu, declared their disapproval of the one country, two systems idea. At the same time, they insisted the 1992 Consensus amounts to something different from Xi’s interpretation. While it is still too early to say that Xi’s remarks backfired by alienating his potential allies and strengthening his opponents, the ceremonial talk did not prod Taiwanese closer to the embrace of China, if that was the intended goal. In his recent speech, Xi Jinping stressed the importance of upholding the 1992 Consensus in developing cross-Strait relations. The 1992 Consensus is no doubt Beijing’s favored construct for discussions, but Brian Hioe’s use of “favored agreement, which states that . . .” could indicate more legal heft than history supports. We know from former Guomindang (KMT) Legislator Su Chi’s own explanation that he created the term in 2000. This is not to deny that important cross-Strait meetings occurred in 1992 and that some sort of tacit understanding along the lines of “one China, respective interpretations” grew out of those discussions. Indeed, the framework of the 1992 Consensus was critical to facilitating relations during Ma Ying-jeou’s presidency. But there was never a formal agreement that stated anything. Reports that Tsai “has torn up” or “rejected” the 1992 Consensus make it sound as if she is repudiating a firm agreement. I leave it to the Republic of China (ROC) government (and the voters who elect that government) to decide the wisdom of using, or not using, the 1992 Consensus as a framing device for discussions. It is their future—and, quite literally, their lives—at stake. The point I care about as a law professor is that amorphous political understandings not be retroactively transformed into concrete legal commitments. China’s focus on the 1992 Consensus has influenced how both sides of the Strait—and the world—discuss cross-Strait relations. Although likened to Yoda in response to a 2015 photo, Tsai does not have the Jedi Master’s power to erase a phrase from people’s minds. Tsai has been a good sport about the continuing Yoda references and even held a “May the 4th Be with You” celebration at the presidential office last year. Despite Yoda’s great wisdom, a hermit who carved out a “survival niche” (shengcun de liji, 生存的利基) on a remote, swampy planet is not the Star Wars character that offers the most hopeful comparison for Tsai, or Taiwan generally. The island needs a dose of the spunky, resourceful Jedi-in-training Rey, who shook up the Star Wars narrative. Tsai’s 2018 National Day address was entitled “Democratic Taiwan Lights up the World,” but her administration has struggled to bring a Rey of new light to the cross-Strait discourse. Times, however, may be changing. Tsai’s rousing response to Xi’s speech affirmed that “democratic values are the values and way of life that Taiwanese cherish.” Her bolder stance has bumped her flagging popularity. Perhaps we’ve entered a new chapter in which Tsai will increasingly flex her Jedi discourse power. Given the paucity of reliable information about the state of the Chinese economy, it is difficult to determine the extent to which economic troubles accounted for Xi Jinping’s appeal to Chinese nationalism in his January 2 message to “Taiwanese compatriots.” By obviating the tacit agreement to disagree on “one China,” and directly tying in the so-called “1992 Consensus” to the “one country, two systems” formula, Xi’s address constituted a hardening of Beijing’s stance on Taiwan. Whatever the factors behind it, the message was noteworthy for how out of touch it was with public preferences in democratic Taiwan. Its only success was that it unified Taiwanese by highlighting what they oppose, regardless of party preference: “one country, two systems” and the mothballing of the “different interpretations” clause which hitherto had been tacitly part of the 1992 Consensus. How do we account for Beijing’s tone-deafness on Taiwan? Either it is an inability to comprehend the vagaries of the island-nation’s democracy—for example, by interpreting the outcome of the November 24 local elections, in which the opposition Guomindang (KMT) made substantial gains, as indicative of support for unification. More likely, it affirms a strategy under Xi of maximum and unyielding pressure on Taiwan, one which underscores the message that unification will only occur on Beijing’s terms, without the possibility of a negotiated agreement in which “Taiwanese compatriots” have a say. This suggests that the main component of Beijing’s approach to Taiwan from now on will be primarily coercive rather than persuasive, imposing an “inevitable” end state rather than seeking to meet Taiwan halfway (“soft” measures being merely tactical). This signals a hardened stance moving forward, with Beijing not relenting even as Taiwan’s January 2020 general elections approach—a period when Beijing would normally seek a lower profile lest pressure push the Taiwanese in a direction it doesn’t want. Xi’s address, and the principles it underscores, has put the KMT in an awkward position: the party had to contradict Beijing on the 1992 Consensus, and distance itself from the formula offered by Beijing. If it were to embrace Xi’s non-negotiables, the KMT would undermine its electoral prospects. Conversely, with an inflexible definition of “one China” and the path to unification, Beijing has bolstered, at least temporarily, President Tsai Ing-wen’s support, and helped position her as a steady defender of the “status quo” in the Taiwan Strait. Meanwhile, the KMT struggles to adapt its message to the curveball Xi has thrown it. By clearly stating his baseline, Xi has inadvertently (we can assume) compelled Taiwan’s “green” and “blue” camps to recognize what unites them, both in terms of what they cherish (democracy, way of life) and what they oppose. The one player that stands to benefit from the tensions that will continue as a result of Xi’s address is the People’s Liberation Army, which more than ever will look like the only option to break the impasse in the Taiwan Strait. While some interpreted Xi’s speech as a stern warning against Taiwan, the speech was not particularly threatening, nor did it communicate that China is impatient to solve the Taiwan issue. However, the core idea, and much of the rhetoric of the speech, was not new: Xi repeated Chinese Communist Party rhetoric of the past four decades, such as “one country, two systems,” “peaceful unification,” “the 1992 Consensus,” “not promise to renounce the use of force,” and “Chinese would not attack Chinese.” This repetition—occurring while anti-Chinese sentiment is taking hold in Taiwan, and while a global anti-Chinese alliance is taking shape—either shows that China is not focusing on the Taiwan issue, or that China no longer knows how to handle it. Either way, I see no sign of China’s use of force to solve the Taiwan issue in the near-term. Xi does face tremendous external pressure from a more hostile U.S., and internal challenges from a wide range of domestic issues this year. However, these tensions do not mean that he would choose to invade another country to rally support for the regime. One message in Xi’s speech which should not be ignored is his potential willingness to offer Taiwan some flexibility on “one country, two systems.” When China used this term in the past, it signified that the Hong Kong model should be applied to Taiwan. However, Xi specifically mentioned “exploring a Taiwanese version of one country two systems” in his speech. This statement may create new possibilities for Taiwan and China to resolve the dispute over sovereignty, and is something which needs to be closely observed in the months to come. However, Xi made one mistake in his speech—he unwisely linked the 1992 Consensus, the one-China principle, and one country, two systems. When Xi met Ma Ying-jeou in Singapore in 2015, he only mentioned the 1992 Consensus, and left room for Ma to promote the Guomindang’s (KMT’s) version of the 1992 Consensus (one China, different interpretations) at home. This intentional ambiguity was one important reason that many Taiwanese believed the KMT was good at handling cross-Strait relations. However, as a Chinese saying goes, “clear water has no fish.” By erasing this ambiguity, Xi has caused the Taiwanese to realize that the KMT’s version of the 1992 Consensus was nothing but wishful thinking. This linkage greatly embarrassed the pro-unification camp, so they cannot help but disagree with Xi’s speech. The KMT’s official response was, “One country, two systems cannot be accepted by the majority of Taiwanese at this moment.” Ma stated, “Xi’s view of the 1992 Consensus is different from that of the KMT,” while Taipei mayor Ko Wen-je said, “Xi’s definition of the 1992 Consensus is not accepted by the mainstream opinion in Taiwan.” As a result, Xi’s speech made him lose potential allies in Taiwan and only boosted domestic support for Tsai Ing-wen, who the Taiwanese see as the only political leader resolutely defending Taiwan’s sovereignty. President Tsai Ing-wen preempted President Xi Jinping in her New Year’s speech by introducing the “four musts” as “the most basic and crucial foundations that will determine whether cross-strait relations develop in a positive direction.” She said China “must face the reality of the existence of the Republic of China (Taiwan); it must respect the commitment of the 23 million people of Taiwan to freedom and democracy.” She also said that China “must handle cross-strait differences peacefully, on a basis of equality,” and that negotiations must be between government-authorized agencies. President Xi followed President Tsai’s speech with his “Message to Taiwanese Compatriots.” Unlike his predecessors, Xi avoided the previous tacit understanding between the People’s Republic of China and the Guomindang regime. Xi also emphasized that while “Chinese will not fight Chinese people,” Beijing will not forgo the military option if it becomes necessary. President Tsai responded defiantly. She emphasized that Taiwan has “never accepted” the so-called “1992 Consensus,” and that Xi’s speech confirmed to the Taiwanese that the People’s Republic of China’s only option for Taiwan is “one country, two systems”—which, Tsai said, the majority of Taiwanese oppose. Tsai also reiterated that Taiwan is a democracy with entrenched values and freedom, and that most Taiwanese treasure such liberty and way of life. Xi’s speech garnered tremendous backlash in Taiwan. According to a poll conducted by the Cross-Strait Policy Association after Xi’s speech, more than 80 percent of the respondents rejected “one country, two systems,” and more than half felt there was never a consensus from the 1992 cross-Strait meeting. Xi’s recent speech formally articulated his administration’s hardened stance on Taiwan. It also indicated that Xi’s Taiwan strategy will be through coercion, intimidation, and threats. In late January, P.R.C. fighter jets flew through the Bashi Channel and then to the western Pacific in a long-distance exercise that came extremely close to Taiwan. According to a recent Taiwan Foundation for Democracy poll, 91 percent of the respondents support the maintenance of status quo, while 76.4 percent of the respondents agreed that “democracy, despite its flaws, is still the best system.” 94 percent of respondents felt that “living in a democratic society is ‘important,’” and over half felt it is “very important.” China’s hardened stance and bullying is repulsive to the Taiwanese. It will not win the hearts and minds of the people of Taiwan, and it also pushes Taiwanese away from unification.